2020 Toyota Supra photo shows front end totally undisguised | Car News, Reviews, & Pricing for New & Used Cars. Alright folks, hang on to your seats. We’re just as gassed as you are over the Toyota Supra’s plodding march to its Detroit Auto Show debut, but this is the real deal. 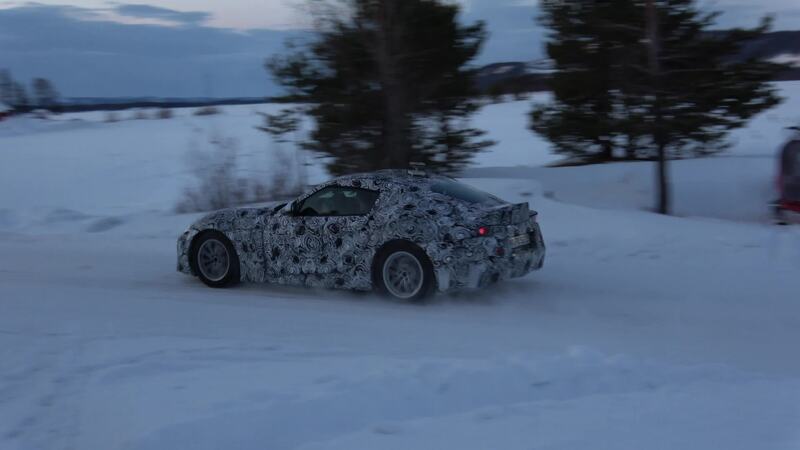 This picture shows a frontal view of the 2020 Supra without any sort of camouflage or cladding at all. Someone on the SupraMkV forums managed to get the photo online, and … it looks great. It sort of looks like we imagined it might under all the camouflage before, but we’re impressed even more now. The sculpting is deep and the muscular lines leading into the hood are awesome. Those are some seriously huge headlight lenses for such a small frontal area, though. Their extension into the center of the front bumper just makes them look even larger. From what we can tell, all the vents and inlets up front look real and functional — a welcome quality in today’s world of giant fake vents everywhere. Overall, we like what we’re seeing here, and we imagine plenty of others will too. If you were looking for any homage to the fourth-generation Supra, that doesn’t seem to have been the designers’ priority. At least the front of the car doesn’t pull inspiration from that Japanese legend. Where the design clearly comes from, is the FT-1 Concept. That design was far too brilliant for it not to go anywhere beyond the swiveling dais in Detroit nearly five years ago. We’re glad to see Toyota took what it could from that design and made it into a production car. Maybe we’ll see even more of the car before the Detroit Auto Show in January, or maybe not. On the in-between, we’ll make sure to keep you abreast of everything Supra.